This soup was a request from Sophia, from her favorite cookbook, the Soups Recipe Card Collection, that we bought at the grocery store check out quite a while ago. We’ve actually enjoyed every soup that we have tried from it, and this one was pretty good as well. Just know that it helps if you are a fan of ramen noodle soup. 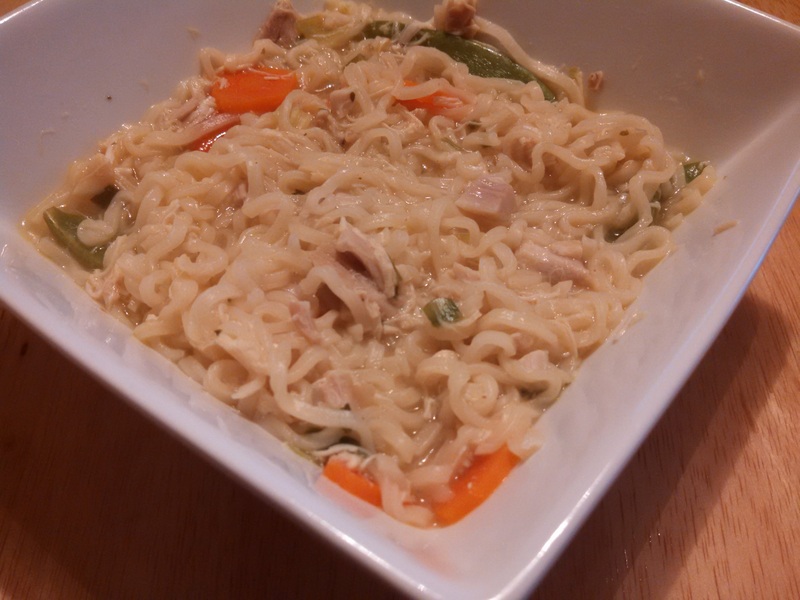 Because, really, this is just a fancy version of ramen noodle soup! However, it is quick, easy, and quite tasty. In a large pot, mix together broth, carrots, green onions, ginger and 1 seasoning packet from the ramen noodles (The remaining 2 seasoning packets can be discarded or reserved for another use). Bring to a boil over medium-high heat. Break noodles in half and stir into vegetable mixture. Boil 2 minutes. Stir in chicken, peas, and lemon juice; cook until heated through. When I decided to make salmon for tonight’s dinner, I was thinking I would do it how I normally do, rubbed with olive oil and lemon pepper seasoning, then cooked on the George Foreman grill. However, I was hoping to maybe come up with something a little different to try. As I was going through the fridge, I found a jar of pesto I had prepared last week, using some fresh basil from someone’s garden and basil from a Sunizona FarmBox. 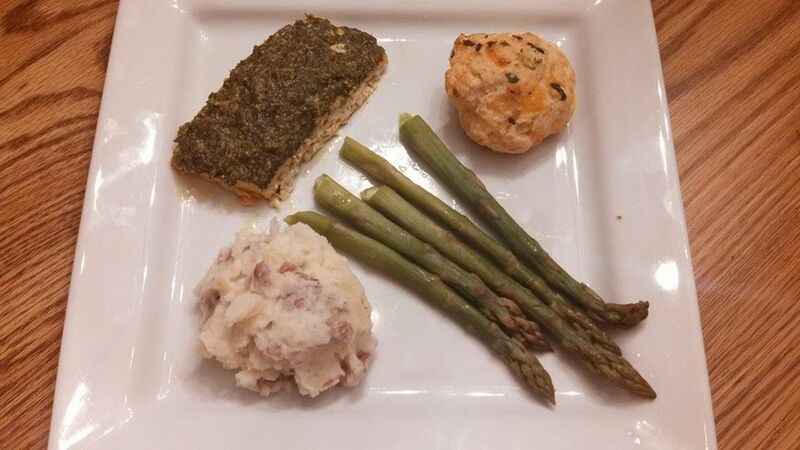 I’ve used pesto when baking chicken before, why not on salmon? Turned out great, and I made mashed potatoes (red potatoes with the skins on), steamed asparagus, and cheddar garlic biscuits. Line a baking dish with foil. Spray with non-stick cooking spray. Arrange salmon fillets in dish, skin side down. Spread pesto on top of each fillet. Bake in the preheated oven for 20-25 minutes, or until salmon easily flakes with a fork. My husband wanted chicken tonight, and since I had basil I needed to use tonight, I thought about using it with some lemon. Then, I came across a honey, lemon, and basil mixture that sounded really good. And it was! It got rave reviews from both girls, and I really enjoyed it too. I served it with garlic green beans. Heat olive oil in a large skillet over medium-high heat. Cook chicken in the oil for a few minutes on each side to brown. Meanwhile, mix together the chicken broth, honey, lemon juice, garlic, and basil. After chicken has browned, pour in the liquid mixture. Reduce heat to medium-low and cover. Cook for 20 minutes, or until chicken is no longer pink and has reached an internal temperature of 180 F. Remove the lid, and continue to cook the chicken until the liquid reduces to a glaze. Turn and brush each side of chicken with the glaze. Remove from heat, and serve. Tonight was one of those nights where I had no idea what to make. Then, a friend of mine shared a picture on Facebook of a chicken and spinach pasta dish, and since I had the ingredients, I decided to give it a try with a few modifications. It also gave me a chance to use my new stainless steel cookware that I got last week. It turned out delicious, and I know I will be making it again, maybe even with some different vegetables next time. Meanwhile, in a large skillet, heat olive oil over medium-low heat. Add garlic and onions, and cook until onions are soft and translucent. Stir in lemon juice, half and half, chicken broth, and Parmesan cheese. Continue to cook on medium-low heat until liquid is bubbly. 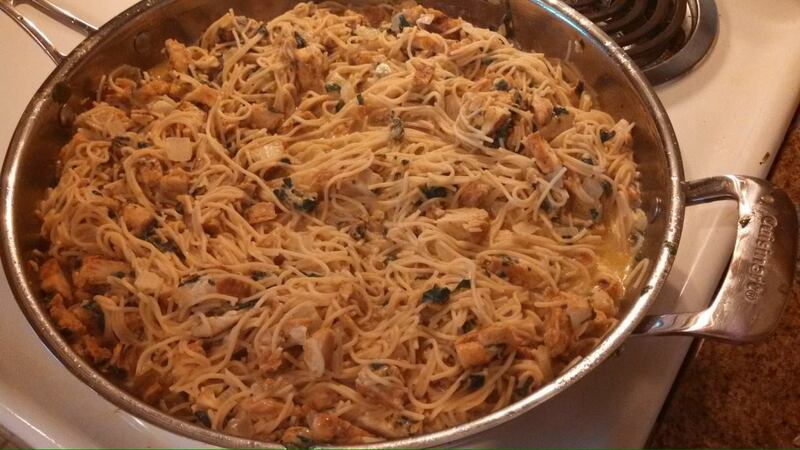 Stir in chicken, spinach and drained pasta. Toss and cook for about 5 minutes. Turn off heat and let sit for 5 minutes to allow sauce to thicken a little. Serve. I got a lucky a few weeks back and was at Fry’s while they were putting out manager’s special whole chickens. So, I got 2 whole chickens, each just a little over $3. I put them in the freezer until I had time to get to them. 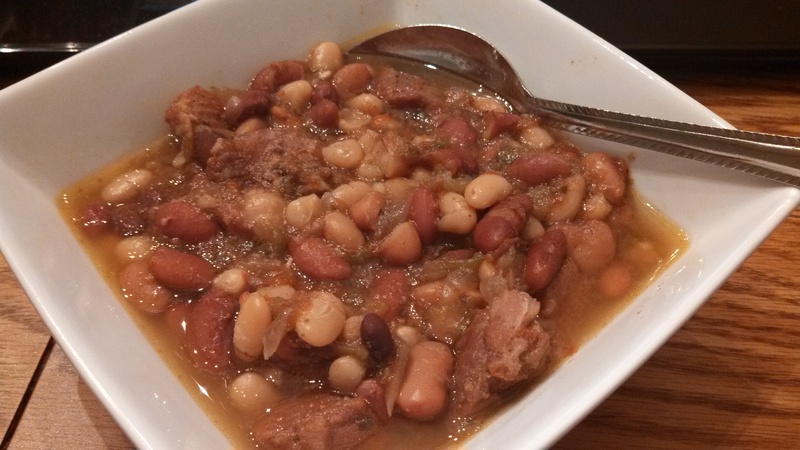 Since it’s still rather hot here, I decided to try making it in the slow cooker instead of the oven. It was pure torture smelling this cook a ll day, and luckily, it tasted great. 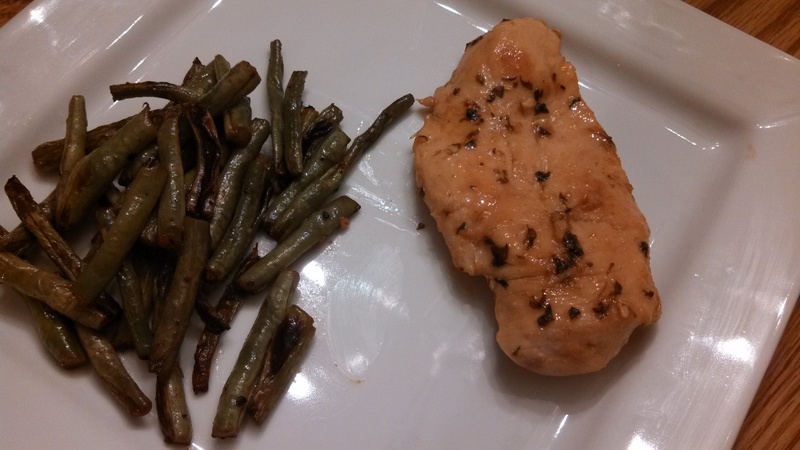 I used green beans and carrots as the vegetables and ate them as a side to the chicken, but you could use any vegetables you prefer, or just do carrots and celery to add flavor while it cooks. 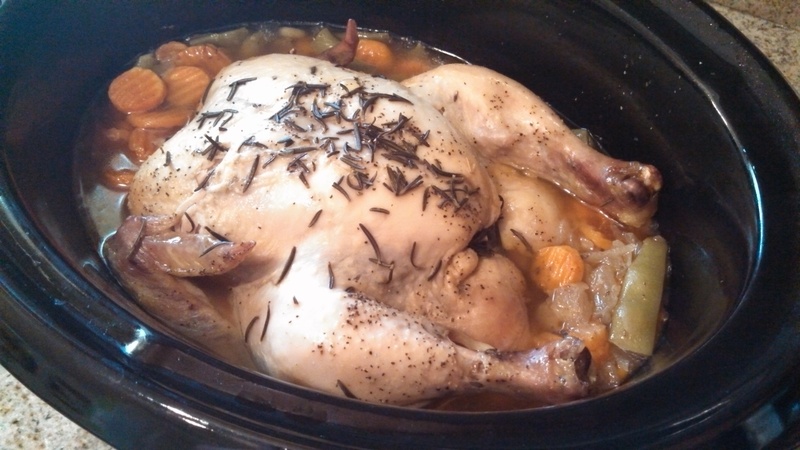 What’s nice about the slow cooker is that it keeps the chicken nice and moist. You don’t even have to add any liquid at the beginning, the juices off the chicken will be enough to keep it moist while it cooks. When it’s done, it just falls off the bone. Yum! After I got all the meat off the chicken, I put the bones back in the slow cooker and filled it with water to make chicken broth! Put vegetables and diced onion in the bottom of the slow cooker. Remove neck and giblets from inside of chicken, and rinse both inside and out. Generously salt and pepper inside of chicken. Cut open garlic cloves and rub over all the chicken. Place inside the chicken. Set chicken breast side up on top of vegetables. Squeeze lemon over the chicken and place the rinds inside chicken. Then, place a few sprigs of rosemary inside the chicken, and place some rosemary leaves on top of chicken, along with salt and pepper. Cover and cook on low for 6-8 hours, or until a thermometer inserted in the breast reads 180 F. Chicken should be moist and falling off the bone. Serve with some of the vegetables, or sides of your choice. This turned out amazing! I had gotten spinach from Bountiful Baskets in the juicing pack I contributed for, and wanted to make it with chicken somehow. So, I started looking through some recipes, and came up with a marinade for the chicken, then topped with spinach and mozzarella cheese. I wanted them to be somewhat flatter, but didn’t pound them flat very well. Just meant that it took a little longer for them to cook. Since I had gotten red potatoes and lemons as well in my regular basket, I thought roasting the potatoes with lemon would be a nice addition. In a small bowl, combine olive oil, lemon juice, rosemary, garlic, salt and pepper. 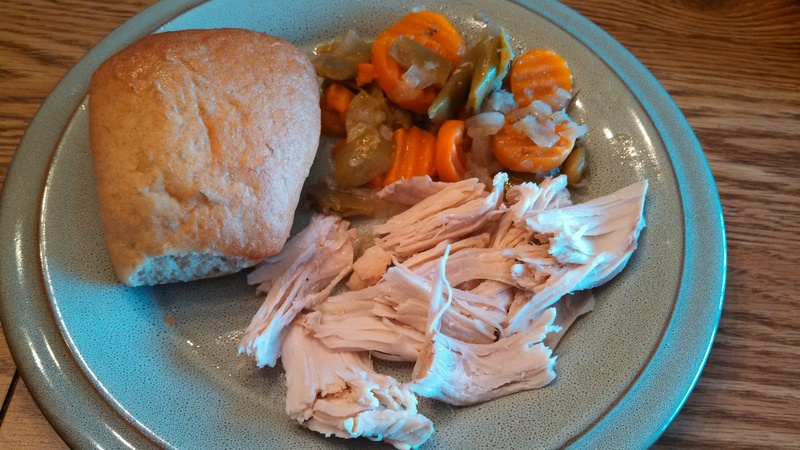 Put chicken on a flat surface in between 2 pieces of wax paper and pound flat. Place chicken in a gallon size zipper bag and pour contents of the bowl over chicken in the bag. 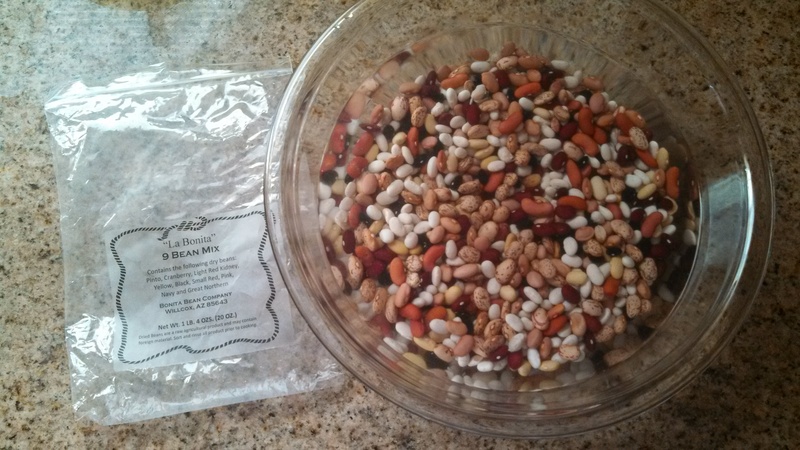 Seal bag and place in refrigerator overnight, or for at least 1 hour before cooking. Remove chicken from bag and discard remaining marinade. Preheat oven to 400 F. Heat a large skillet over medium heat. Cook chicken in skillet for about 5 minutes each side to slightly brown it. Remove from skillet and place in a baking dish. In the same skillet, put in the spinach and cook for a few minutes until spinach wilts. 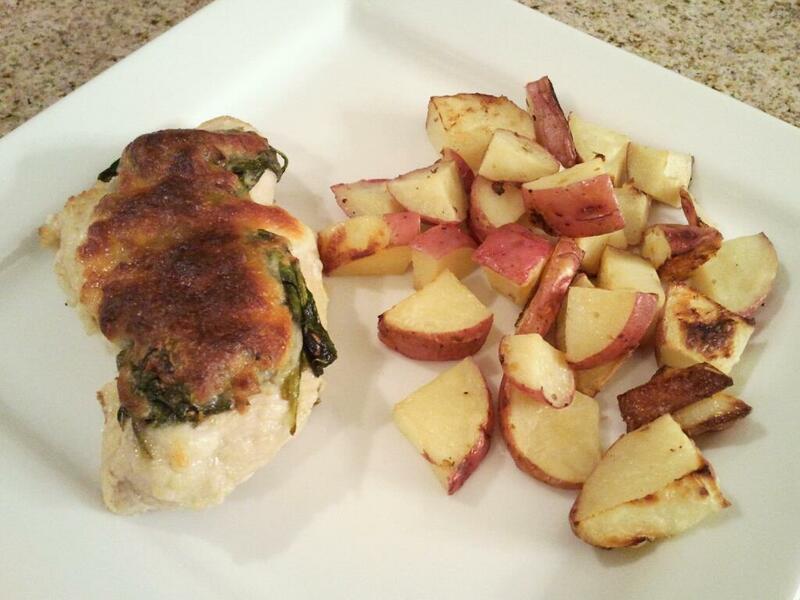 Place spinach on each of the chicken breasts in baking dish. Next, put shredded mozzarella on top of the spinach on each chicken breast. Bake in the preheated oven for 20-25 minutes, or until chicken is cooked fully through and cheese is melted. Dice the potatoes, leaving skins on. Place in a large bowl. In a small bowl, mix together remaining ingredients. Pour over the potatoes in the large bowl. Toss to fully coat potatoes. Spray a foil lined baking sheet with non-stick spray. Spread potatoes in an even layer on the baking sheet. Cook in the preheated oven for 20 minutes. Stir potatoes around on baking sheet. Continue to bake for 15-20 minutes, or until potatoes are browned and softened. I wasn’t sure what to call this, because I didn’t add any ice cream or milk like a smoothie, I called it a chiller, like the ones at McDonald’s, but with fresh ingredients. To make it, I used the 2 packages of the frozen strawberries and 1 package of the frozen lemon juice cubes I had made recently. It turned out great and super sweet, so you could add more crushed ice to it to help make it less sweet. Or, reduce or omit the sugar, the strawberries I had were probably sweet enough to do without any sugar. We had some friends over today, and all the kids loved it! Bring the water and sugar to a boil on the stove long enough to dissolve the sugar. Allow to fully cool. 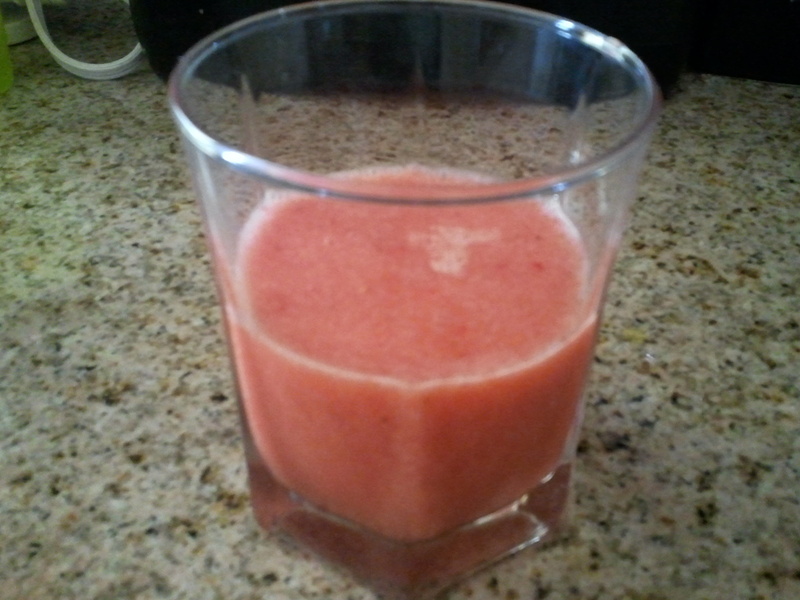 Put the strawberries and sugar/water mixture in a blender and puree until smooth. 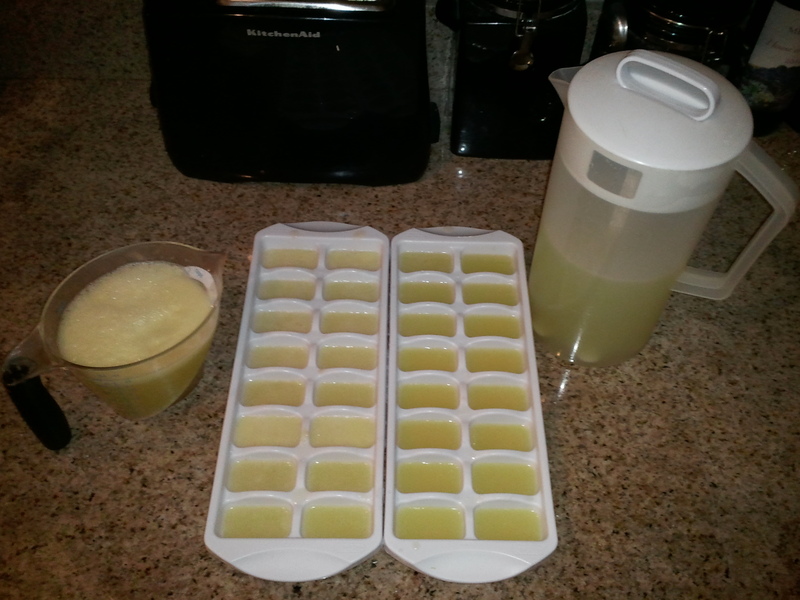 Add in lemon juice cubes, and again, puree until smooth. If mixture is too sweet for you, pour the mixture into a pitcher, then use blender to chop up 1-2 cups of ice cubes, and add to the pitcher, mix in well. I had watermelon that was sitting around not getting eaten, which is actually odd for my house. So, I needed to come up with a way to use it. 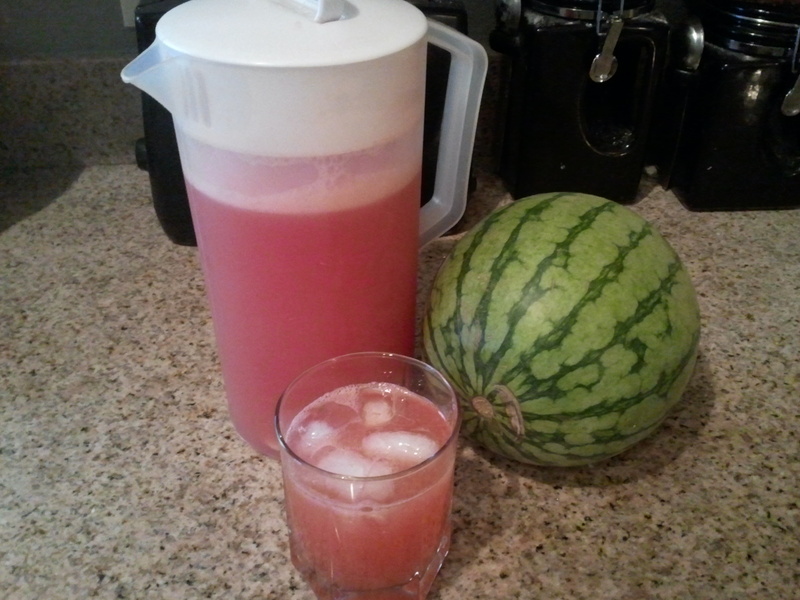 I searched allrecipes.com and came across a recipe for Watermelon Lemonade. It’s still rather easy, like the Lemonade recipe I had posted previously, just adds in a couple of steps for the watermelon. It ends up being a nice, cool treat on a hot day like today is! Put the watermelon in a blender. Cover, and blend until smooth. Strain through a fine mesh strainer. You will end up with 1-1/2 to 2 cups of liquid after straining. Pour the strained liquid into a 2 quart pitcher. Add lemon juice into a 2 quart pitcher. Heat 2 cups of water and the sugar, and stir until sugar dissolves. Let cool. Pour sugar and water mixture into the pitcher. Add enough water to fill the 2 qt pitcher. Stir well. Chill in refrigerator for a couple of hours or serve over ice. This past week’s Bountiful Baskets had a case of approximately 38 lbs lemons available as an extra. A friend of mine decided to get them and wanted to share, so I went in on the box. There were 3 of us, and the box had 75 lemons, so we got 25 lemons each. So, what does one do with 25 lemons? I cut and peeled them, then ran them through my juicer. I probably could have left the peels on, but I didn’t want the lemon juice to be too strong and tart. I was very happy to end up with about 7 cups of lemon juice. 1 cup was made into lemonade, 4 cups are currently freezing in ice cube trays in my freezer (each cube is 1 oz), and 2 cups is in a container in the refrigerator until I decide what to do with it. I may make some Strawberry Lemonade next, since I have plenty of strawberries. Pour lemon juice into a 2 quart pitcher. Pour sugar and water mixture into the pitcher. Add another 2 cups of water to the pitcher. Depending on your taste, you may want to add more or less sugar or water.